Nathan Drake and his half-tuck are well known PlayStation icons that have permeated the video game industry. Drake’s face has become the Mario-like mascot of the PlayStation brand, and his voice is widely known as Nolan North’s eponymous character. With Uncharted 4 on the horizon for Sony’s current generation powerhouse, it’s unsurprising then that Naughty Dog would want to give PS4 owners a chance to join Drake on his first three adventures originally released on the PlayStation 3. Naughty Dog and Bluepoint are no strangers to HD remasters, with Naughty Dog handling The Last of Us Remastered on PS4 and Bluepoint having previously done lauded collections like God of War Collection, Metal Gear Solid HD Collection, and a number of other remastered titles. 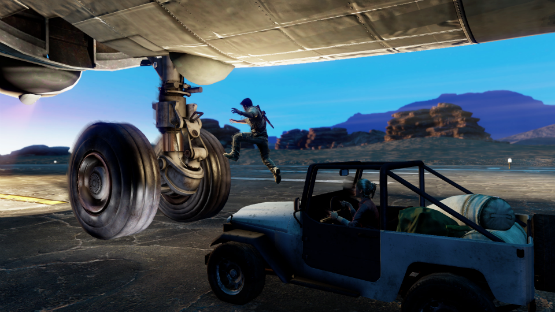 Subsequently, the teaming up of these two developers leads us to a remaster collection that is an incredible labor of love, and the perfect lead up to Uncharted 4, whether you’ve played the Uncharted games before now or not. Now bear with me for a moment. 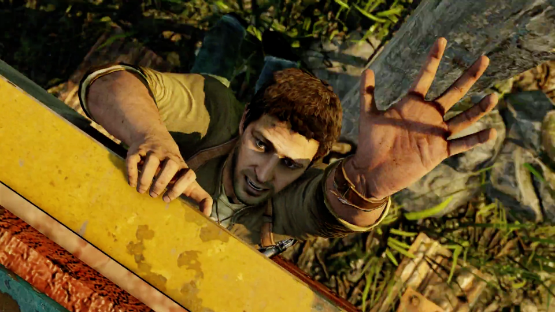 There are two kinds of people in this world: Those that have played the Uncharted games, and those that haven’t. For those of you that already have, I’ll get you in a moment. Right now, we’re going to briefly focus on those who — for some inexcusable reason — missed adventuring with Nathan Drake on PS3. 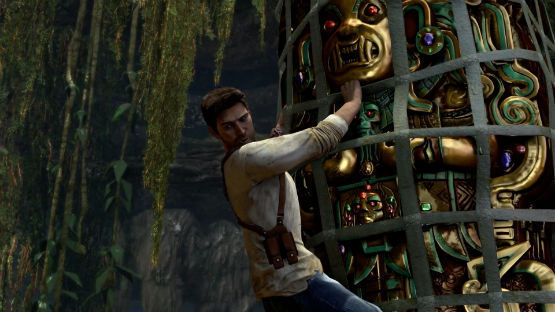 When Uncharted: Drake’s Fortune was new on the scene early in the PS3’s life, it set the bar for cinematic gaming. Its perfect balance of action set-pieces, platforming, puzzles, and shooting made it incredibly fun to play, and it was helped along by the stunning voice acting and motion capture that brought the believable characters to life. Naughty Dog’s jump from the cartoon styled platforming of Jak & Daxter to something a bit more grounded in reality was a resounding success, and earned a ten out of ten from us. 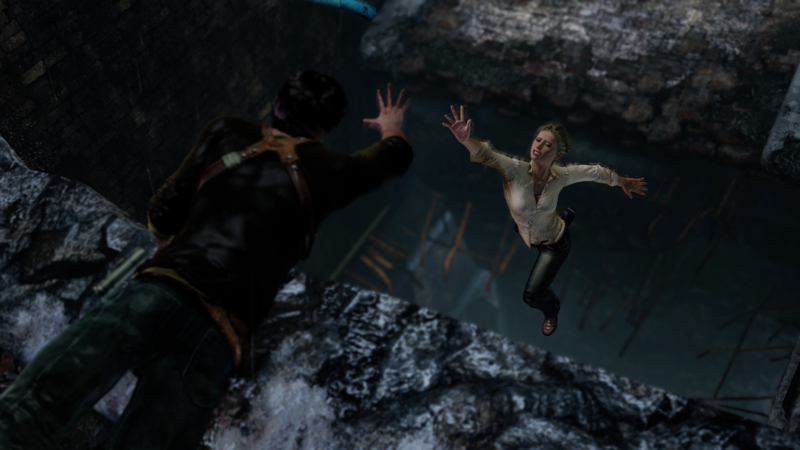 Uncharted 2: Among Thieves and Uncharted 3: Drake’s Deception each set the bar even further and higher, with better visuals, bigger and more memorable action sequences, and deeper story arcs. From the opening moments of the snowy train crash intro in Uncharted 2, to the epic desert plane crash of Uncharted 3, Naughty Dog outdid themselves two more times with amazing games that further attached players to Drake, Sully, Elena, and Chloe. Everything that Naughty Dog did with this trilogy earned each game a perfect ten from us (Uncharted 2 review, Uncharted 3 review). If you want to know more about each individual game prior to its remastered status, check out each of those reviews for more information on just what made them so special. Time to address those of you that have already played the Uncharted games on PS3. The good news is that nothing has been downgraded or removed from the single-player campaigns of each game. While the collection may not include the multiplayer portions from 2 and 3, every aspect of the single player is intact just as you remember it. Well, perhaps not quite as you remember it, and this is where returning players will see the most benefit in this collection. Nathan Drake reliving past glories simply looks and plays better on the PS4, and the changes are significant. Not only is each game in 1080p and running at a silky smooth 60fps, they’ve also had work done to the textures, character models, and effects throughout each of the three games. Details and draw distances are rendered in greater depth and further out making each scene much more rich than its PS3 counterpart, and everything loads quickly and smoothly. While the difference is most noticeable in the first Uncharted game due to its being the oldest of the three, one can’t ignore the fact that Uncharted 3 looks like a bonafide PS4 game. Regular readers of the site may not take much stock in my saying this, but I didn’t run into any technical issues in the collection, and actually marveled at the technical resolutions that Bluepoint has made to many of the nitpicky problems that the PS3 games had. Don’t take my word for it though, technical analysis has already proven my point. It would have been enough for Bluepoint to offer the deep level of reworking each game rather than performing a simple up-rez, but they took it a step further. The controls have been worked with to provide easier navigation and aiming. They feel more responsive to your inputs and less floaty than before. Again, this is most noticeable on the first Uncharted, but the sequels find benefit in this too, and the whole package feels cohesive as you switch between games. Each title’s previously hardest difficulty, Crushing, is now unlocked from the beginning, so you can test your hand at the soul melting difficulty offered by Naughty Dog. This early unlock is to allow the new difficulty mode, Brutal, to remain locked until you complete the trial of Crushing. I had a fairly brief time to review the entire collection, so I wasn’t able to unlock Brutal, but if it’s really more difficult than Crushing, it sounds like fans are in for a challenge and a treat if they want to try to take on that difficulty. I’ll be livestreaming my own attempts to get through it after it releases. On the opposite end of the spectrum, there’s a new easier difficulty called Explorer, which essentially allows players to get the story without having to worry about difficulty. The last new mode of play is a time trial mode that records your time and promotes speedruns of the full game, as well as practice runs for each individual chapter. While none of these modes drastically change the game in any way, they are just little ways to further alter and tweak the user experience, and they don’t take away from the greatness that is there. In my opinion, Bluepoint’s best new addition is that of a photo mode, which I’ve voiced before as this generation of consoles’ must-have feature. Photo mode was one of my favorite aspects of the PS4 inFAMOUS games, and we loved it’s inclusion in The Last of Us Remastered. I wish that there was a little bit more freedom with the camera in each scene (it feels tightly locked to a center point, so it can sometimes be difficult to get things framed up just the way you want), but ultimately I’ve wasted a ton of time taking epic shots of Drake climbing, punching dudes in the face, and standing thoughtfully on sunny vistas. The photo mode also allows you to get a close look at the deep remaster work that Bluepoint did with each game. That ten down there is wrong. It should be a 30 but our site won’t go that high. Uncharted: The Nathan Drake Collection is not one or two, but three of the best PS3 games, remastered with precision, love, and care for the current generation. Bluepoint has taken three of Naughty Dog’s gems from the PS3, polished them up more than we imagined they could be, and put them back out into the world. Whether you’re new to the PlayStation family and want to catch up on the adventures of one of their titular characters, or your looking to relive Uncharted again before the release of A Thief’s End, there’s little reason not to own this phenomenally remastered collection of beloved PS3 classics and rediscover the treasures on PS4. 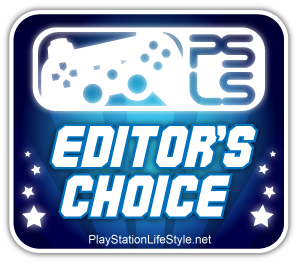 Uncharted: The Nathan Drake Collection review copy provided by publisher. Reviewed on PlayStation 4. For more information on scoring, please read our Review Policy here. If you hate remasters, good things, and joy, you might not like this?